80 year old Berliner Hans-Joachim Roedelius works at a frenzied pace, leaving a trail of some 200-odd releases behind him and many new ones already in the works. Over four days in September, Haus der Kulturen der Welt dove into this rich catalogue of work to present Lifelines, a career retrospective and celebration of the pioneering musician’s artistic legacy. Glass display cases enabled visitors to follow Roedelius’ life from his school days and early career as an actor through to his successes with the highly influential duo Cluster, experiments in commercial music with Harmonia, collaborations with Brian Eno and countless others through to the present day. Family photos, press clippings, promotional material and selections from Roedelius’ personal archive gave an interesting glimpse into his life away from the pianos and synthesizers. Installations, a collection of tour posters and boxes of vinyl and CDs at the gallery store, rounded out the exploration into the ephemera surrounding Roedelius’ career, but the obvious centre point of Lifelines was the veritable smorgasbord of musical performances on offer. The man himself appeared with no fewer than eight different ensembles and performed a brief piano solo on the first night. It was fascinating to see and hear him adapt to so many different collaborators with many different styles; to watch the ebb and flow of creativity and inspiration in real-time with one of electronic music’s most influential figures. The first night’s concert began with a performance by Choir der Kulturen der Welt and three synth players, delivering a reinterpretation of a cantata written in 1730 by Johann Christian Roedelius. The musical bloodline runs back quite some time it seems! Hans-Joachim sat listening from his piano stool, swaying in time with the music but not contributing. When the performance was complete, he let out a swift, beautiful flow of notes from the piano before stepping up to the microphone to speak briefly about the event. The solo piano performance that followed was one of the highlights of the entire event: sublime, gorgeous and emotional. A succession of collaborators then appeared. 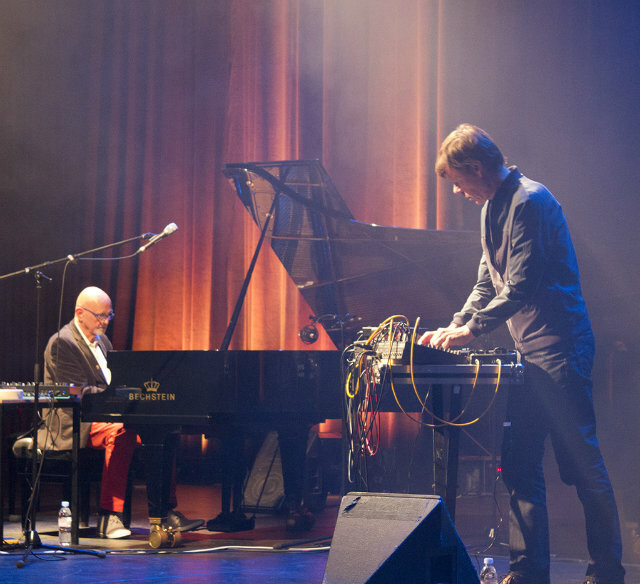 The first was keyboardist Arnold Kasar, who allowed Roedelius to return to the microphone to recite some of his poetry as Kasar played the piano. Hearing the two of them alternate offered an insightful glimpse into the different tonalities available on a single instrument when performed by different people. Beneath Kasar’s fingertips the piano was crisp and clear, while Roedelius summoned a softer, more mellow tone from the same set of keys. Keyboardist Tim Story and cellist Lukas Lauermann were next to join him, and delivered a beautiful, melancholy set with charming background visuals by an uncelebrated character standing off to the other side of the stage. Indeed, the visuals were fantastic for the duration of the event, curated to provide the perfect foil to the sounds emanating from the stage. Story and Lauermann gave way to Christopher Chaplin, son of the famous actor Charlie. The music he and Roedelius generated was space-age electronic sounds, drifting off towards the Cluster oeuvre. The evening was rounded out by further electronic exploration from Roedelius and Stefan Schneider, complete with gesturing from Schneider that seemed as much a part of his performance as the curious sounds coming from his array of boxes and patch leads. Qluster’s performance on Saturday night was the absolute highlight of the entire Lifelines program. 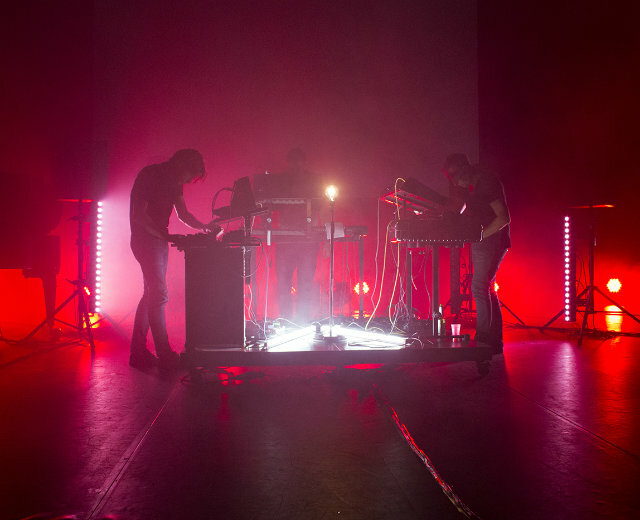 The third incarnation of the project that has been Kluster, Cluster and Qluster, the trio moved around a densely packed mountain of keyboards and electronic equipment to deliver an astonishingly beautiful set. The performances from Astronauta Pinguim (complete with live oil-lamp projections) and Elektronische Staubband were good tool, but were perhaps unfairly dwarfed by Qluster’s absolute perfection. The group didn’t stop once, seamlessly drifting from piece to piece in a haze of cloudy electronics and gentle piano: it was immaculate. The Sunday night began with a rather out of place assortment of acoustic pop from Lloyd Cole, who explained that he was unable to come up with a full set of electronic music and had brought his guitar to fill in the gaps. The audience seemed pleased with this and offered rousing applause to each of his numbers; although the two electronic pieces he performed with Roedelius were considerably more engaging. The final event was a set by Roedelius and Christoph Mueller, which was more strident and 80’s flavoured than the prior electronic sets. It was a fine conclusion to a very pleasing event indeed.